Rhyming words are fun to say. And make reading work feel like play. Alright, alright. I’m not going to rhyme this whole post today. (Kidding!) But we will be having fun with rhymes as we build our own reading game for some fun rhyming practice. It’s one of the stepping stones to learning how to read. It’s all a part of phonemic awareness. Phonemic awareness is simply learning about language, like the sounds and how they go together. Learning to hear the sounds and how to decode them. It’s something our kids are doing every day. But, rhyming doesn’t stop the minute a child learns to read. It’s a great thing to practice to help your kids get even better at reading and decoding words. This game is an easy way to to have fun practicing rhymes. Divide your cardboard tubes in half, either cut them or eyeball them. 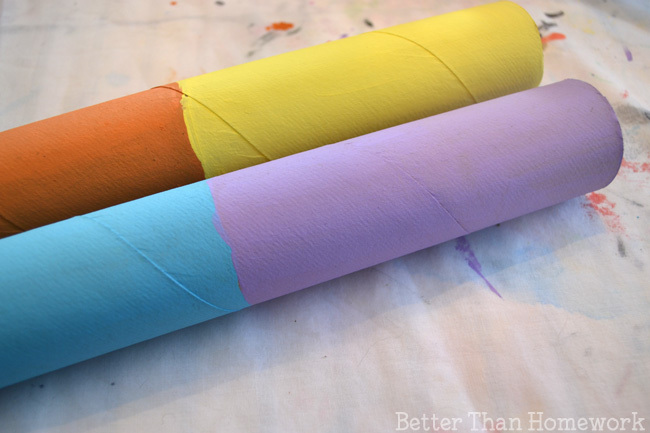 Paint each half a different color so you have four different colors of cardboard tube. After your tubes have dried, cut each color segment into four different pieces. You’ll have 16 different sections, four in each color. Divide your tubes into sets so that each set has one of each color. Use your black marker to write your words. 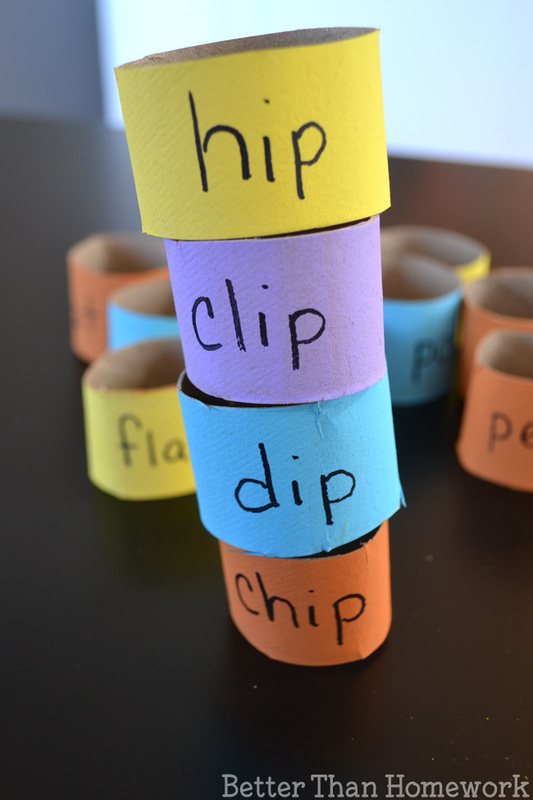 Each set will be one group of rhyming words, for example: clip, chip, hip, and dip. Change up the rhyme for each set. Hint: This game is a great way to incorporate words your child needs to work on. Are there words from a sight word list you can choose? 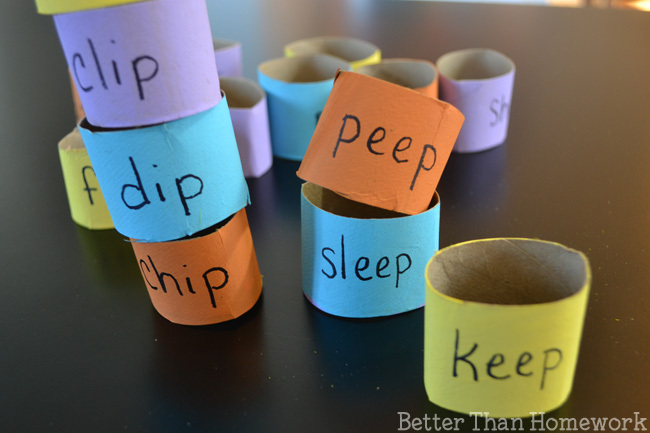 Are there specific ending sounds your child needs to work on, like -eep? Make sure to include those words. Mix up all your cardboard words on a table. 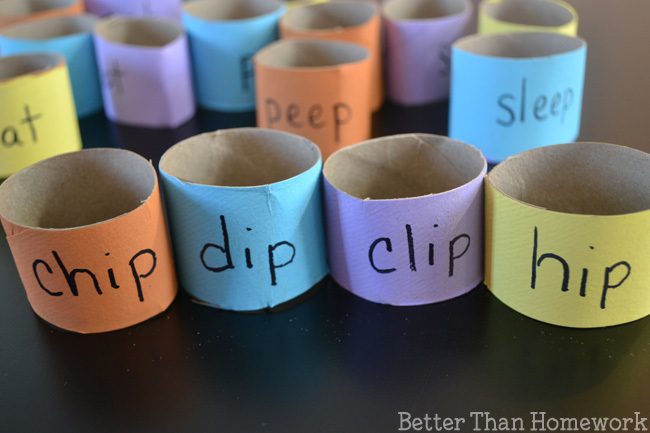 Have your child make stacks of each set. 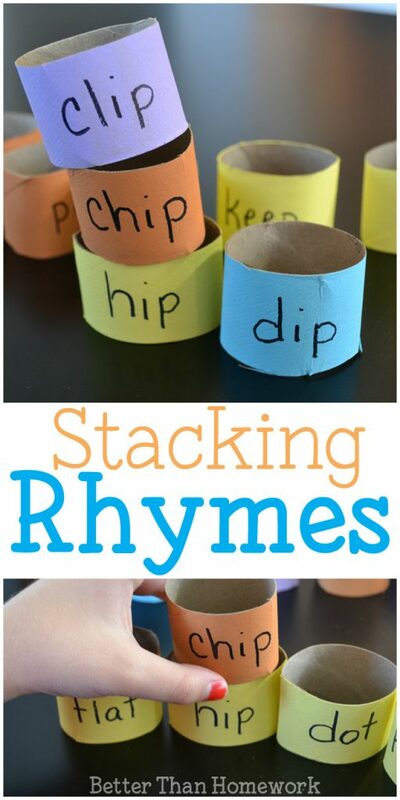 Stacking can get a bit tricky at times and your rhyming tower may collapse. But, that’s part of the challenge! If the stacking gets frustrating, make pyramids. Or, just line up your rhyming words. Instead of including four words in each set, use only two words so you can match up pairs. Turn this into a hide and seek game. 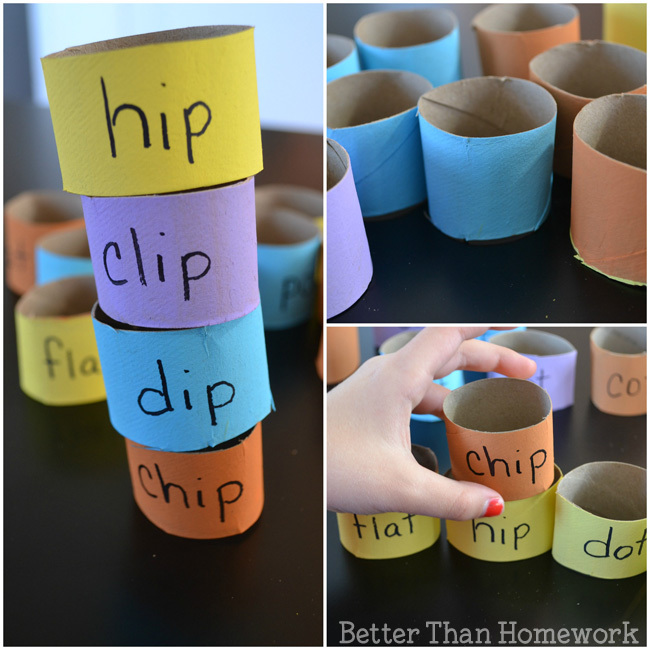 Hide the cardboard tubes around the room and challenge your kids to find the rhymes. See if they can name even more words for each set. How many words can you come up with? 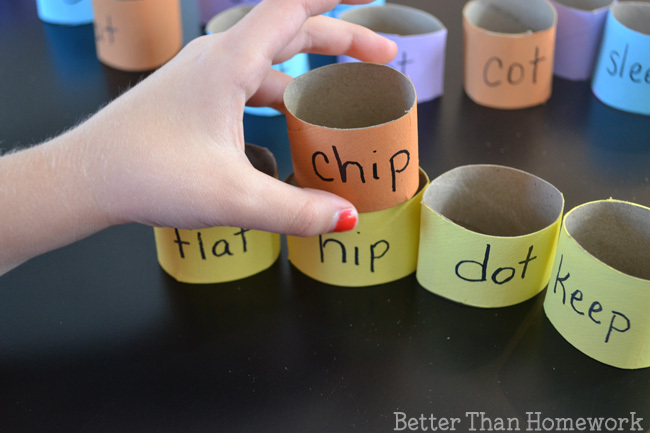 Have fun practicing rhyming words with this fun DIY reading game. Did you enjoy this post? If so, you can share the above image on Facebook or the image below is perfect for Pinning.